To know God’s work in these times is, for the most part, to know what the principal ministry of God incarnate is in the last days, and what He has come to do on earth. I have previously mentioned in My words that God has come to earth (during the last days) to set an exemplar before departing. How does God set this exemplar? By speaking words, by working and speaking throughout the land. This is God’s work during the last days; He only speaks, so that the earth becomes a world of words, so that every person is provided for and enlightened by His words, and so that man’s spirit is awakened and he is clear about the visions. During the last days, God incarnate has come to earth chiefly in order to speak words. When Jesus came, He spread the gospel of the kingdom of heaven, and accomplished the work of redemption of the crucifixion. He brought an end to the Age of Law, and abolished all the old things. The arrival of Jesus ended the Age of Law and ushered in the Age of Grace. The arrival of God incarnate of the last days has brought an end to the Age of Grace. He has come chiefly to speak His words, to use words to make man perfect, to illuminate and enlighten man, and to remove the place of the vague God within man’s heart. This is not the stage of work that Jesus did when He came. When Jesus came, He performed many miracles, He healed the sick and cast out demons, and He did the work of redemption of the crucifixion. As a consequence, in his conceptions, man believes that this is how God should be. For when Jesus came, He did not do the work of removing the image of the vague God from man’s heart; when He came, He was crucified, He healed the sick and cast out demons, and He spread the gospel of the kingdom of heaven. In one regard, the incarnation of God during the last days removes the place held by the vague God in the conceptions of man, so that there is no longer the image of the vague God in man’s heart. Through His actual words and actual work, His movement across all lands, and the exceptionally real and normal work that He does among man, He causes man to know the reality of God, and removes the place of the vague God in man’s heart. In another regard, God uses the words spoken by His flesh to make man complete, and accomplish all things. This is the work that God will accomplish during the last days. 1. The work of God is not supernatural, and you should not harbor conceptions about it. 2. You must understand the principal work that God incarnate has come to do this time. He has not come to heal the sick, or to cast out demons, or to perform miracles, and He has not come to spread the gospel of repentance, or to grant man redemption. That is because Jesus has already done this work, and God does not repeat the same work. Today, God has come to bring an end to the Age of Grace and cast out all the practices of the Age of Grace. The practical God has come chiefly to show that He is real. When Jesus came, He spoke few words; He primarily displayed miracles, performed signs and wonders, and healed the sick and cast out demons, or else He spoke prophecies in order to convince man, and to make man see that He really was God, and was a dispassionate God. Ultimately, He completed the work of crucifixion. The God of today does not display signs and wonders, nor does He heal the sick and cast out demons. When Jesus came, the work He did represented one part of God, but this time God has come to do the stage of work that is due, for God does not repeat the same work; He is the God that is always new and never old, and so all that you see today is the words and work of the practical God. God incarnate of the last days has come chiefly in order to speak His words, to explain all that is necessary to the life of man, to point out that which man should enter into, to show man the deeds of God, and to show man the wisdom, omnipotence, and wondrousness of God. Through the many ways in which God speaks, man beholds the supremacy of God, the magnitude of God, and, moreover, the humility and hiddenness of God. Man sees that God is supreme, but that He is humble and hidden, and can become the least of all. Some of His words are spoken directly from the perspective of the Spirit, some of His words are spoken directly from the perspective of man, and some of His words are spoken from the perspective of the third person. In this can be seen that the manner of God’s work varies greatly and it is through words that He allows man to see it. God’s work during the last days is both normal and real, and thus the group of people of the last days are subjected to the greatest of all trials. Because of the normality and reality of God, all people have entered amid such trials; that man has descended into the trials of God is because of the normality and reality of God. During the age of Jesus, there were no conceptions or trials. Because most of the work done by Jesus was in accordance with man’s conceptions, people followed Him, and had no conceptions about Him. The trials of today are the greatest ever faced by man, and when it is said that these people have come out of the great tribulation, this is the tribulation that is referred to. Today, God speaks to create faith, love, sufferance and obedience in these people. The words spoken by God incarnate of the last days are according to the substance of man’s nature, according to the behavior of man, and according to that which man should enter into today. His method of speaking[a] is both real and normal: He does not speak of tomorrow, nor does He look back on yesterday; He speaks only of that which should be entered into, put into practice, and understood today. If, during the present day, there is to emerge a person who is able to display signs and wonders, cast out demons, heal the sick, and perform many miracles, and if this person claims that they are Jesus who has come, then this would be the counterfeit of evil spirits, and their imitation of Jesus. Remember this! God does not repeat the same work. Jesus’ stage of work has already been completed, and God will never again undertake that stage of work. The work of God is irreconcilable with the conceptions of man; for example, the Old Testament foretold the coming of a Messiah, but it turned out that Jesus came, so it would be wrong for another Messiah to come again. Jesus has already come once, and it would be wrong if Jesus were to come again this time. There is one name for every age, and each name is characterized by the age. In the conceptions of man, God must always display signs and wonders, must always heal the sick and cast out demons, and must always be just like Jesus, yet this time God is not like that at all. If, during the last days, God still displayed signs and wonders, and still cast out demons and healed the sick—if He did exactly the same as Jesus—then God would be repeating the same work, and the work of Jesus would have no significance or value. Thus, God carries out one stage of work in every age. Once each stage of His work has been completed, it is soon imitated by evil spirits, and after Satan begins to follow on the heels of God, God changes to a different method. Once God has completed a stage of His work, it is imitated by evil spirits. You must be clear about this. Why is the work of God today different to the work of Jesus? Why does God today not display signs and wonders, not cast out demons, and not heal the sick? If Jesus’ work were the same as the work done during the Age of Law, could He have represented the God of the Age of Grace? Could He have completed the work of crucifixion? If, as in the Age of Law, Jesus had entered into the temple and kept the Sabbath, then He would have been persecuted by none and embraced by all. If that were so, could He have been crucified? Could He have completed the work of redemption? What would be the point if God incarnate of the last days displayed signs and wonders, like Jesus? Only if God does another part of His work during the last days, one that represents part of His management plan, can man gain a deeper knowledge of God, and only then can God’s management plan be completed. During the last days, God has come chiefly in order to speak His words. He speaks from the perspective of the Spirit, from the perspective of man, and from the perspective of the third person; He speaks in different ways, using one way for a period of time, and uses the ways of speaking to change the conceptions of man and remove the image of the vague God from man’s heart. This is the main work done by God. Because man believes that God has come to heal the sick, to cast out demons, to perform miracles, and to bestow material blessings upon man, God carries out this stage of work—the work of chastisement and judgment—in order to remove such things from the conceptions of man, so that man may know the reality and normality of God, and so that the image of Jesus may be removed from his heart and replaced by a new image of God. As soon as the image of God within man becomes old, then it becomes an idol. When Jesus came and carried out that stage of work, He did not represent the entirety of God. He performed some signs and wonders, spoke some words, and was ultimately crucified, and He represented one part of God. He could not represent all that is of God, but represented God in doing one part of God’s work. That is because God is so great, and so wondrous, and is unfathomable, and because God only does one part of His work in every age. The work done by God during this age is chiefly the provision of the words for the life of man, the disclosure of the substance of the nature of man and the corrupt disposition of man, the elimination of religious conceptions, feudal thinking, outdated thinking, as well as the knowledge and culture of man. This must all be laid bare and cleansed away through the words of God. In the last days, God uses words, and not signs and wonders, to make man perfect. He uses His words to expose man, to judge man, to chastise man, and to make man perfect, so that in the words of God, man comes to see the wisdom and loveliness of God, and comes to understand the disposition of God, so that through the words of God, man beholds the deeds of God. During the Age of Law, Jehovah led Moses out of Egypt with His words, and spoke some words to the Israelites; at that time, part of the deeds of God were made plain, but because the caliber of man was limited and nothing could make his knowledge complete, God continued to speak and work. In the Age of Grace, man once more saw part of the deeds of God. Jesus was able to show signs and wonders, to heal the sick and cast out demons, and be crucified, three days after which He was resurrected and appeared in the flesh before man. Of God, man knew no more than this. Man knows as much as is shown to him by God, and if God were to show nothing more to man, then such would be the extent of man’s delimitation of God. Thus, God continues to work, so that man’s knowledge of Him may become deeper, and so that he may gradually come to know the substance of God. In the last days, God uses His words to make man perfect. Your corrupt disposition is disclosed by the words of God, and your religious conceptions are replaced by the reality of God. God incarnate of the last days has chiefly come to fulfill the words that “the Word becomes flesh, the Word comes into the flesh, and the Word appears in the flesh,” and if you do not have a thorough knowledge of this, then you will still be unable to stand fast. During the last days, God primarily intends to accomplish a stage of work in which the Word appears in the flesh, and this is one part of God’s management plan. Thus, your knowledge must be clear; regardless of how God works, God does not allow man to delimit Him. If God did not do this work during the last days, then man’s knowledge of Him could go no further. You would only know that God can be crucified and can destroy Sodom, and that Jesus can be raised from the dead and appear to Peter…. But you would never say that God’s words can accomplish all, and can conquer man. Only through experiencing God’s words can you speak of such knowledge, and the more of God’s work that you experience, the more thorough your knowledge of Him will become. Only then will you cease to delimit God within your own conceptions. Man comes to know God by experiencing His work, and there is no other correct way to know God. Today, there are many people who do nothing but wait to see signs and wonders and the time of the catastrophe. Do you believe in God, or do you believe in the catastrophe? If you wait until the catastrophe it will be too late, and if God does not send down the catastrophe, is He then not God? Do you believe in signs and wonders, or do you believe in God Himself? Jesus did not display signs and wonders when He was derided by others; was He not God? Do you believe in signs and wonders, or do you believe in the substance of God? Man’s views about belief in God are wrong! Jehovah spoke many words during the Age of Law, but even today some of them have yet to be fulfilled. Can you say that Jehovah was not God? Today, it should be clear to all of you that, in the last days, it is principally the fact of “the Word becomes flesh” that is accomplished by God. Through His actual work on earth, He causes man to know Him, and to engage with Him, and to see His actual deeds. He causes man to clearly see that He is able to display signs and wonders and there are also times when He is unable to do so, and this is dependent on the age. From this you can see that God is not incapable of displaying signs and wonders, but instead changes His working according to His work, and according to the age. In the current stage of work, He does not show signs and wonders; that He showed some signs and wonders in the age of Jesus was because His work in that age was different. God does not do that work today, and some people believe Him incapable of displaying signs and wonders, or else they think that if He does not display signs and wonders, then He is not God. Is that not a fallacy? God is able to display signs and wonders, but He is working in a different age, and so He does not do such work. Because this is a different age, and because this is a different stage of God’s work, the deeds made plain by God are also different. Man’s belief in God is not the belief in signs and wonders, nor the belief in miracles, but the belief in His real work during the new age. Man comes to know God through the manner in which God works, and this knowledge produces in man the belief in God, which is to say, the belief in the work and deeds of God. In this stage of work, God mainly speaks. Do not wait to see signs and wonders; you won’t see them! For you were not born during the Age of Grace. If you had been, you could have seen signs and wonders, but you were born during the last days, and so you can see only the reality and normality of God. Do not expect to see the supernatural Jesus during the last days. 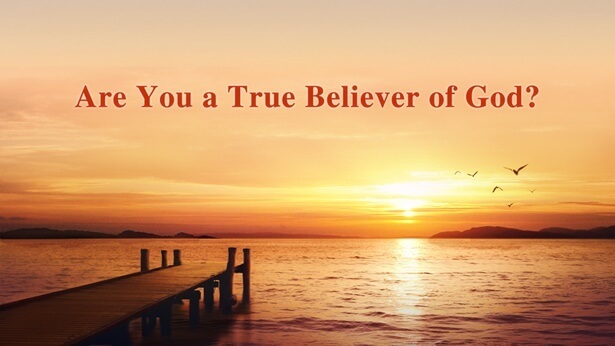 You are only able to see the practical God incarnate, who is no different from any normal man. In each age, God makes plain different deeds. In each age He makes plain part of the deeds of God, and the work of each age represents one part of the disposition of God, and represents one part of the deeds of God. The deeds that He makes plain vary with the age in which He works, but they all give man a knowledge of God that is deeper, a belief in God that is more down-to-earth, and more true. Man believes in God because of all of the deeds of God, and because God is so wondrous, so great, because He is almighty, and is unfathomable. If you believe in God because He is able to perform signs and wonders and can heal the sick and cast out demons, then your view is wrong, and some people will say to you, “Are not evil spirits also able to do such things?” Is this not to confuse the image of God with the image of Satan? Today, man’s belief in God is because of His many deeds and the many ways in which He works and speaks. God uses His utterances to conquer man and make him perfect. Man believes in God because of His many deeds, not because He is able to show signs and wonders, and man only understands Him because they see His deeds. Only by knowing the actual deeds of God, how He works, what wise methods He uses, how He speaks, and how He makes man perfect—only by knowing these aspects—can you comprehend the reality of God and understand His disposition, knowing what He likes, what He loathes, how He works upon man. By understanding the likes and dislikes of God, you can differentiate between that which is positive and negative, and through your knowledge of God there is progress in your life. In short, you must gain a knowledge of God’s work, and must put straight your views about the belief in God. Next：Is the Work of God So Simple as Man Imagines?